Adorable cookie jar especially if you are a teacher. 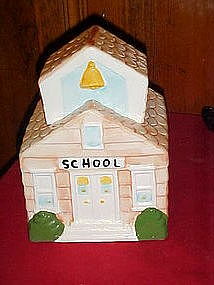 This little old fashioned schoolhouse cookie jar is made of hand painted glazed ceramic and is in wonderful condition. No damages or repairs. Measures 9" tall.